Surprise! I posted the entire ending all at once so you can enjoy it all together. I’ve started a new comic called Wilde Life and you can start reading it here. If you want to pick up some originals, you still can right here. Wow I started in 2003, I was not a regular weekly visitor, but I would visit once every six months and read through it all. Cant think of anything I have committed to for such a long time. I’ve lived in about ten places, held about three different jobs, had about two personal laptops (4 work), one marriage, and a baby, during all these years. Its time I bought myself something zap related. I… I, I don’t know what to say. This was one of my first comics. Before I read two kinds, before I read Girl Genius, hell, before I read pvp, xkcd, lfg, or Ctrl-alt-del, I read Zap! 7 full years ago, I started reading this. And sure, I missed updates once in a while, but I’d always just go back and read the last 100 pages to make sure I was caught up. This was a beautiful journey, and I am so grateful that I got to ride along. I just read the whole comic in one night, after randomly stumbling upon Wilde Life. It felt kooky at first, in an amusing way, and now at the end of it, I’m emotionally drained to the point of “wuh?”. I adore this comic, and what you’ve done with it. Thank you for letting us in on your journey, both of you. It’s funny how I heard of Wilde Life before Zap!, but it’s a pity that I only heard of it on a discussion on Girls With Slingshots when they announced it’s cancelation. It’s neat though, reading through these comments and seeing all the people who’ve been along with this from the start, or those like me who discovered it after it wrapped up, and everybody in between. Oh wow. I discovered this comic a few day ago and I just couldn’t stop reading it. Such a great story. What initially seemed like lighthearted fun, quickly developed into a very compelling story and I’m really amazed at how the long game was already hinted at in those early pages. There’s just nothing better than a well-plotted story. Then there is the art. Pascalle, I was amazed to watch your technique grow and change over the years. Zap, Gunner, and Efrem were the three spirits. You should post your version! Well, I can’t very well refuse you can I. :) Enjoy! Once there were three spirits, a falcon, a serpent, and a tiger. The falcon had sharp eyesight and could see for miles. The serpent’s forked tongue made him a powerful speaker and he could convince anyone of his way of thinking. The tiger was brave and would face anything with no fear for his own self. The three were brothers and lived happily together growing up. For a while at least. While the three spirits were still young a great evil descended on their world. The spirits were torn from their family and friends and forced to fight for the evil. Serpent dreamt of revenge and had little trouble in convincing his brothers to help him. Years passed and Serpent’s power of persuasion allowed him to absorb the evil into himself while shielding his brothers from its effects. When he finally managed to fully absorb the spirit, however, he found he could not control it and instead it warped his mind. Before long Falcon could see the effect the evil had on his brother and the devastation he planned to wrought on the world. He took the only path left to him and, warning Tiger of Serpent’s plan, they confronted him. Serpent tried to talk them around again but their hearts were hardened to their brother’s gift, and so he attacked. Serpent was strong and though Falcon was close to his power he knew he could not defeat Serpent without some kind of advantage. Falcon climbed high into the air, the better to strike a killing blow, while Tiger held Serpent back. Tiger was no match for Serpent though and he knew it. Still he fought him to a standstill, falling to breathe his last under Serpent’s fangs, his bravery giving Falcon enough time to prepare. Hurtling back towards the earth, Falcon’s gleaming talons spread beneath him, ready to impale the snake that was his brother. At the last moment Serpent turned to meet the falling bird and talons and fangs clashed in a last epic strike. Dawn found all three brothers lying together, united once more in death. I just read this over a two day period and I have to say that this is an EXCELLENT comic with a great story. The art improved immensely over time. 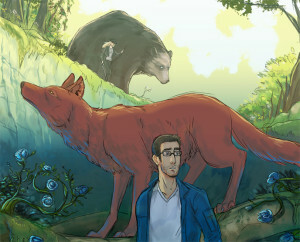 One of the best completed webcomics that I’ve ever had the pleasure to read. Read this in one sitting and loved it!!! So amazing! Wow. Talk about cathartic. Perusing your comments, it seems that you have already heard much of what I’m about to type so I’ll keep it small. Wonderful job! I found Zap about a week ago from a Wild Life link (Been a reader there from the beginning) and very happy I did. The story was brilliant, the characters beg for the readers to empathize with them, and the art. To see your last few panels side by side with the first? We the readers are not the only ones enriched by your story. Your style has ripened into something truly amazing. 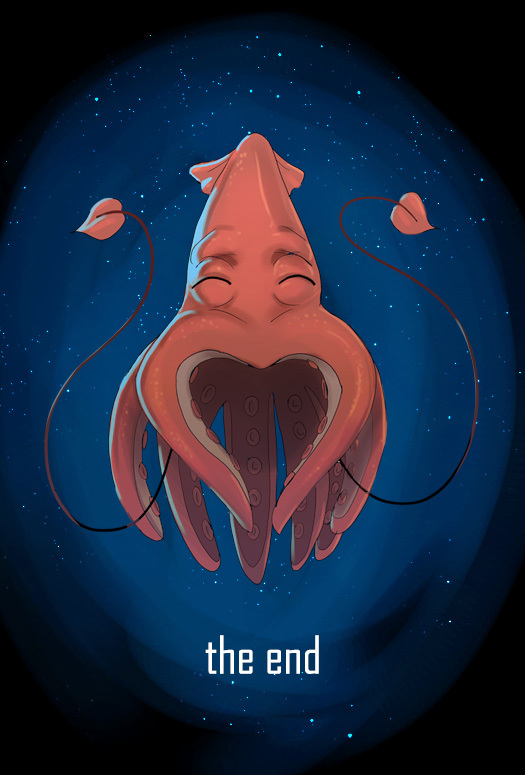 To read a great story with such emotion from start to finish (while endings are bittersweet as we say goodbye), is something that makes us more human. Thank you for this. I’m not crying, I just have particles in my eyes. Bwah! I just finished reading this, and it’s beautiful! Now I wanna cry from this awesome ending! So many particles! Thanks for reading! Well thank you for taking the time to read it all. We appreciate all the words of praise. Thank YOU so much for reading it and taking the time to tell us how you feel. Its the best part about creating something. Thanks for the words of kindness! Thank you for the kind words. It makes a writer feel good to hear things like that. Hey, better late than never right? I’ve heard it flows much better when read all at once without waiting a week between, so you might have been in a better situation, right? Thanks for the words of praise! Well we appreciate you being a reader and hope you enjoyed the journey! Fanfic huh? Does my never published changes and forgotten storylines and side plots count as my own fanfic? Whats yours gonna be about? Sorry for the delay. I’ve decided to check and go through the comments again to see if there are new ones since the inital ending. I’m glad you were able to enjoy our creation even if it was a bit later. Thanks! Thanks so much. Glad you found the courage to finish. It took a bit of that for us as well. I once had a severe rash. I went to the doctor and they tested for @lepas. Thankfully the results were negative. Turns out I just need to take showers… who knew? Aw, thanks! YOU’RE one of the best readers! Thanks for sticking with us over all those years! Thanks for saying so. Thats a long time to be a reader. Thanks for sticking with us! HEY SCREW YOU!!!! Thanks so much for being a fan and for helping support our Kickstarter. That whole ordeal was rough on us, but it had nothing to do with our great fans who helped us, but almost every other step was soul crushing and we just wanted to get you guys the books you wanted… sigh. What a mess. I hope you enjoy the books you got though, and thanks for the compliments on the comic! Thanks for coming back and finishing! Glad you enjoyed it. I know, right? What a crazy thing. Hope you ejoyed it! As they say in Italy, “Thanks for reading the comic!” … its totally a famous Italian saying. Do you have the old Keenspot printed ones or the new reprints?